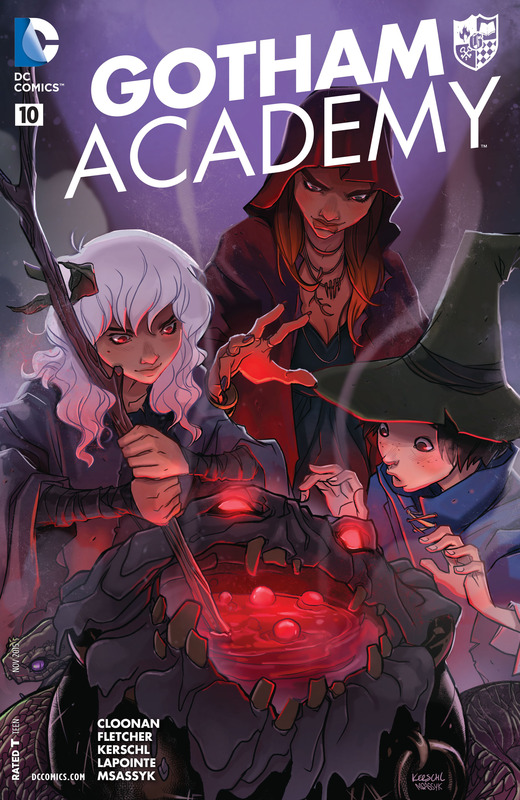 It seems to be quite a novel appearance on the cover of the week posts for a DC comic, but Gotham Academy is one exceptional book. The creative team converge on a harmonious note to produce a teenage book full of wonder, mystery and excitement. The cell shading animation-esque artwork began quite niche but has bedded in wonderfully with respect to the tone of the book. This cover is an example of that with the young cast playfully pretending to be witches to match the black magic theme of the latest arc. The characters have subtle variations of their usual clothes with beautiful cloaks and hats. Where Kirsch and Msassyk succeed so essentially is providing that slightly exaggerative facial expression that appeals to a younger audience but still exacts that very adult emotion. The hand gestures are all unique and infer the casting of a spell but it is the eyes and eyebrows are pertinent in displaying the intent and wonderment of these kids, and Maps is as excitable as ever on the right. The cauldron is a monster with a gaped mouth full of a bubbling solution and I like the branch as a makeshift stirrer. However it is the colouring of the whole cover that helps it to leap from the page with purples and ends merging into the smoke. It brings the impression of a dark, warm and eerie environment which can only lead to trouble. Excellent work for a cover of an excellent comic.